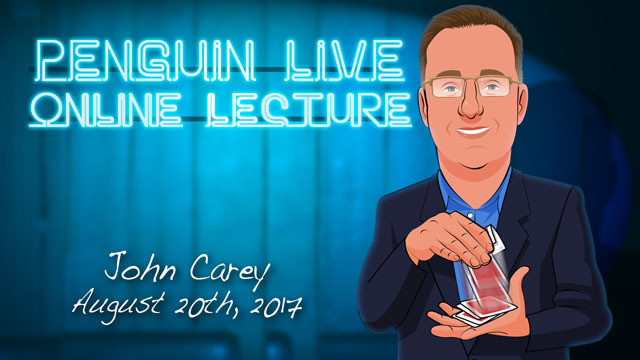 Today, when you order "John Carey LIVE", you'll instantly be emailed a Penguin Magic gift certificate. You can spend it on anything you like at Penguin, just like cash. Just complete your order as normal, and within seconds you'll get an email with your gift certificate. 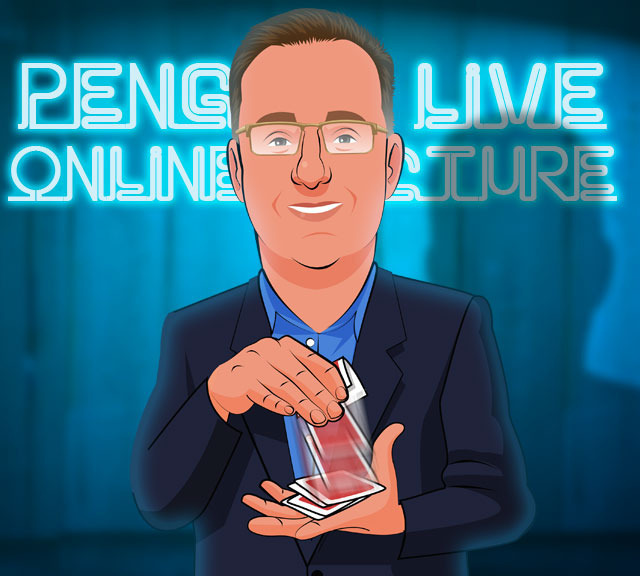 John Carey LIVE (Penguin LIVE) Streamlined, practical card and coin magic for discerning magicians. SUPPORT LIVE MAGIC. DOWNLOAD THE FULL LECTURE TODAY. magic that is direct, powerful and simple to perform." - Ryan Schlutz. routine. A perfect visual ice breaker! are magically hung into the air and vanish completely! beautifully progressive routine with a knockout ﬁnale! Worker!!! Snapshot An ultra clean translocation of 3 signed cards with no palming! ﬁnale. You will love the elegant construction here. An Open or Closed Prediction A super streamlined approach to a Paul Curry classic. make your spectator the star! Impromptu and totally practical! premise of time travel. Another worker! classic effect. So simple, but oh so strong. invented by Jennings and inspired by Fisher. A great closer. 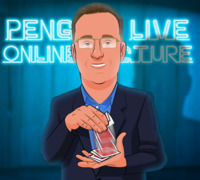 On Sunday, August 20th, anytime after 12:00pm Eastern, click the MyPenguinMagic area at the top of the Penguin site. You'll see the "learn" button appear next to this lecture. I think this was a very acessible lecture that gives something for everyone. Mr Carey is extremely likable, which conceals extreme cleverness, exemplified by his "work smarter not harder" mindset in creating magic. He is very good with crediting(except on his "Homage to Jennings", where he appears to have independently created a very similar handling to the great Derek Dingle, and I suspect this was an oversight). I will definitely end up performing some of this material so, thank you Mr Carey! I saw this lecture live at the P3 Theatre. After seeing the show, and taking many notes on the tricks, I knew I had to get this download. Mr. Carey's tricks are very accessible and real workers. His tricks are truly streamlined without any extraneous or super difficult sleights. And most importantly, they are amazing. Mr. Carey is an excellent teacher and is very straightforward in his presentations. Besides being a super nice guy! So, why should you part with your hard earned money to buy this? Is it worth it? For you coin guys out there, the coin tricks presentations alone are worth the cost. Card guys will, of course, be able to add some great tricks to your act. 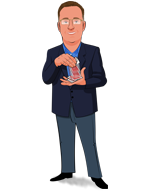 Besides, as Mr. Carey states in the download, even though he is a card guy, he always opens with the coin trick he teaches here. Face it, card guys, the fastest way to scare off a "no-mage" is by opening with a "pick a card" trick. Put simply you will get at least one, if not many, tricks that you will use from this download. And face it how many tricks have you purchased for $29.95 that you just don't do? John's demeanor and style hides the thought and technique that goes into the magic he teaches. These are all gems that will require more performance than finger-twisting. Great detailed explanations for everything. You'll be doing some of these after just a small amount of practice. You won't be disappointed with this live session with John Carey. If you know John's work or not you have to get this because he's just good. He's got good stuff for Ambitious which some might go into my ACR. A good card force that I can see will seem like a miracle to lay people on how you knew the card(he even says he gets great reaction from it). Most of all he's just great on every level. If you love card stuff he is the man, for making you work less for more BANG. *Also a really nice click pass if you're in to coin work. I had the honor to be part of the live audience for John Carey's instructional performance. I had a front row seat and was spell bound by what he was able to do, and made it a so natural. Filled with fresh and doable moves to support simple and entertaining effects. Mostly cards, some coins. This was by far one of the best shows to date! I already see some things I cant wait to use in my routine! There was something for everyone, making magic easy and powerful at the same time. I enjoyed it all! He constructs trick in a practical way. His kind explanation is helpful.